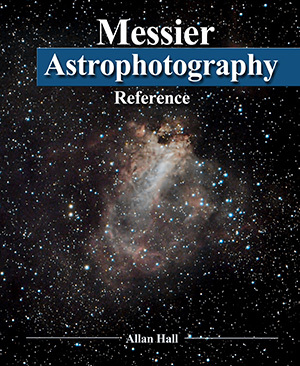 MESSIER ASTROPHOTOGRAPHY REFERENCE IS AVAILABLE NOW! 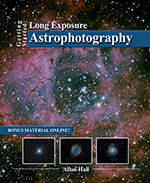 If you have been looking for a single resource you can use on your desk and out in the field to help you image all the Messier objects in North America, then this is your book! All 110 of the Messier objects are covered and include the best times to shoot it, approximate size of the object in your field of view, realistic processed image of the target, shoot notes, star charts and a scientific description. Look for it on Amazon.com and other fine retailers. 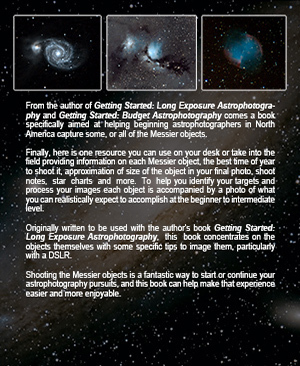 Allan Hall’s Messier Astrophotography Reference takes the task of providing a detailed, practical, visual guide to the night sky’s Messier Objects – all 110 of them – seriously, but not without the author’s trademark approachability and goal of providing home-based astrophotographers at any experience level with the fundamental resources they need to shoot smart. In North American skies, throughout the year, a series of bright visual bodies, groups, formations, and phenomenon are categorized as Messier Objects. 110 of these are flung across the galactic veil that we see every night. For each star: a cluster. For each cluster: a galaxy. From nebula to clouds to clusters, these astrological objects are striking, nuanced, each with its own sky path and yearly phases. The task of capturing these in images can be daunting for astrophotographers, making Messier’s Astrophotography Reference all the more impactful of a guide. For astrophotographers: the number of factors to consider when searching out the ideal celestial shot can be daunting. From yearly charts of the night sky’s movements to sizing objects, gauging their depth, and choosing how to capture them, astrophotographers have long relied on fundamental – and luckily unchanging – guides for astrological behavior. 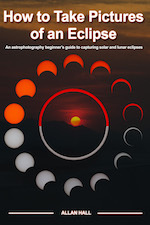 From the author of Getting Started: Long Exposure Astrophotography and Getting Started: Budget Astrophotography comes a uniquely comprehensive book sure to change the way that just about any astrophotographer’s views their discipline. A question: What do the Southern Pinwheel Galaxy, the Owl Nebula, and 108 other striking astronomical bodies have in common with you? For the first time: they’re all accessible. From home. 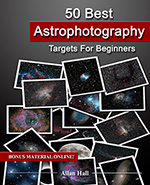 For beginning astrophotographers. Now – finally – with Allan Hall’s Messier Astrophotography Reference – the lessons of Getting Started: Long Exposure Astrophotography and Getting Started: Budget Astrophotography are elevated, targeted, and laid out in an intuitive format meant for providing home-based astrophotographers with a practical road map for all 110 North American Messier Objects in the night sky. From your bedroom desk to nights in the field, Messier Astrophotography Reference represents a condensed, intuitive resource. In it, each Messier Object is highlighted with a photograph and a rich entry of details, context, sizing, yearly shooting charts, and more. Hall’s approachable tone makes for a clean narrative in which the goal is the keenest understanding of these objects, their “characters”, movements, obstacles in shooting, and points of interest. As a companion piece for Getting Started: Long Exposure Astrophotography, this book takes on a natural supplementary role. Further developed by its author to be a full standalone resource on its own, Messier Astrophotography Reference is comprehensive, targeted, and brisk. From sizing your shot to deciding on your range of depth – Hall takes readers from step one to the final shutter snap; giving them the tools to interpret their experience with the Messier Objects. 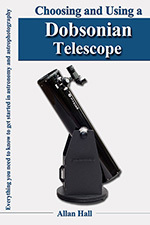 For anyone with practical astrophotographical ambitions; whether they’re gathering supplies and waiting for that first shoot or experienced astrophotographers ready to delve into a comprehensive Messier Object guide, Allan Hall’s Messier Astrophotography Reference is essential. You can read more about Messier objects on Wikipedia. Monochrome vs OSC CCD cameras, which is right for you? Subscribe to our mailing list to receive notice of new book releases, updates, sales, free giveaways, and more!